President's Day songs, arts and crafts, and activity theme ideas for preschoolers! 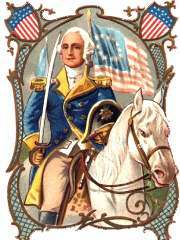 Presidents Day is the common name for the federal holiday officially designated as Washington's Birthday. My hat it has 3 corners. Cut three 12" X 3" strips of construction paper for each child. 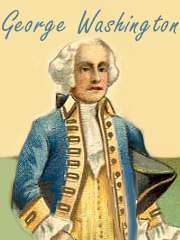 Let the children make three-cornered hats like the ones worn in George Washingtons Day. Have each child staple together the ends of the three strips of construction paper(making a triangle). Children can then wear their hats for their other activities. Provide children with 3-6 pennies. Cut clear contact paper in half, enclosing the pennies. Adjust bracelet to slip on child's wrist. Glue twigs on sheets of sturdy white paper to make trees. Let children attach small red circle sticker "cherries" or use finger prints dipped into red finger paints. Draw a simple picture of a log cabin. Have the children glue cinnamon sticks on the picture to represent the logs. Finally, glue a penny in the door of the cabin. Lay 2 pennies and a quarter on a strip of clear contact paper. Fold it over and wrap around each child's wrist as a bracelet. Have children make an American flag. Have them paint several tongue depressors red. Cut a blue paper square about 1/4 the size of a sheet of white paper. Glue it in the left hand corner.When sticks are dry, glue them on the page making a red stripe, then the white paper, another red and continue on. Have the children glue cotton balls on the blue part to be stars. Even if the children don't want to do the typical American flag--that's fine! They can create their own tribute to our country! Just have fun! A child flips a penny or quarter and if the presiden't head turns up the child may call out something for the class to do, i.e. clapp your hands. The coin is passed to another child and the game continues until all children have been able to flip the coin. Sit in circle. One player is the Cherry Tree, who stands in center of circle with eyes covered. Adult chooses one player to touch Cherry Tree & say,"Chop, chop." Cherry Tree falls down gently & player returns to place in circle. All players then say with deep voices, "Who chopped the cherry tree?" Cherry Tree opens eyes & guesses who it was. That player then becomes Cherry Tree, & the game is repeated. We laugh a lot while playing this! Create giant coins from cardboard--at least two of each kind. (Laminate them or cover them with contact paper if you wish to keep them from year to year.) Put the giant coins on the floor and march around them while playing music. When the music stops have the kids pick up the coin in front of them and try to match it to a friend's coin. This activity is good for learning the names of coins as well as the presidents on them.